The suspension of a scheduled air drill between South Korean and US military forces was first proposed by the Pentagon. A senior official from the Ministry of National Defense told reporters that while Exercise Vigilant Ace, slated for December, would not go ahead, the South Korean military would proceed with its own unilateral exercises. The official said that Secretary of Defense Jim Mattis first proposed the idea of suspending the air drill to his South Korean counterpart Jeong Kyung-doo. While Jeong agreed with Mattis in principle, he replied that more discussion was needed to maintain a readiness posture. “Mattis shared our views after being briefed about our position sufficiently,” said the official, adding that Mattis ordered his staff to review South Korea’s suggestion before the two countries held a Security Consultative Meeting later this month. The official added that the US was reluctant to carry out a massive exercise involving high-profile assets. 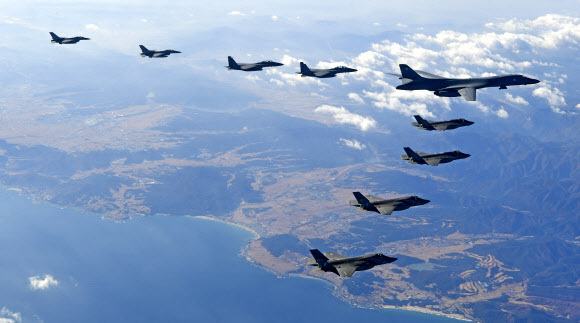 Last year’s Vigilant Ace was held on the biggest-ever scale, involving US stealth fighters as a show of force against North Korea’s nuclear and missile tests. Jeong, who had served as the Air Force Chief of Staff, told Mattis that the air drill doesn’t necessarily involve commitment of massive assets and thus the exercise did not have to be suspended altogether, according to the official. The remark came amid speculation over the difference in the timing and nuance of the suspension announcements. The Pentagon announced the suspension of Exercise Vigilant Ace on Friday, but it took about a day for the South Korean Defense Ministry to confirm its suspension. In a message sent to reporters Saturday, the Defense Ministry said South Korea and the US agreed on various military options, including the suspension of Exercise Vigilant Ace, to support diplomatic efforts toward North Korea. The official said a Pentagon spokesperson made the announcement, specifically using the word “suspension,” while Jeong and Mattis were engaged in bilateral consultations last week during a regional security meeting in Singapore.